Hats off (or, if you're fair skinned like me, hats on) to my very favorite friend, Summertime. This summer, I've got my health in mind more than ever. So far, I've begun the season on a good foot. I'm on my way to achieving some fitness goals (I'm now able to run almost 2k without stopping!) Also, seeing as the (typical Montreal) bipolar weather hasn't allowed me to obtain much of a tan, I've decided to embrace my paleness and accept that it's healthier, and that I'm avoiding skin cancer. I say that as I type this in the sunshine. With SPF... 8... Moving on! Most importantly, I've been cooking and eating healthier (minus the almost nightly trips to the ice cream shop... what? It's summer, I'm allowed. Stop judging. You're jealous.) I've always found that eating light in the summer is easy, because of the abundance of fresh produce, and the absence of the desire to cook anything that involves a hot oven. Goodbye are the days of heavy potato stews, creamy casseroles and hefty roasts. Hello to the days of garden salads, fresh corn and fruit parfaits. Now that I've embraced cooking for one, I actually enjoy making myself something fancy looking from time to time. For instance, on this lovely sunny afternoon, I was inspired by the basil plant growing wildly in my garden. Today is the perfect day for a basil toast, I thought to myself. While at first I had the intention of chopping the fresh basil and sprinkling it over some cold tomato sauce, I decided it would be even more 'summery' of me to chop up some fresh cherry tomatoes. And well, toast just isn't toast without a little bit of cheese now is it? 3 minutes later, I had this masterpiece. note: multiply quantities by the number of people you'll be serving. 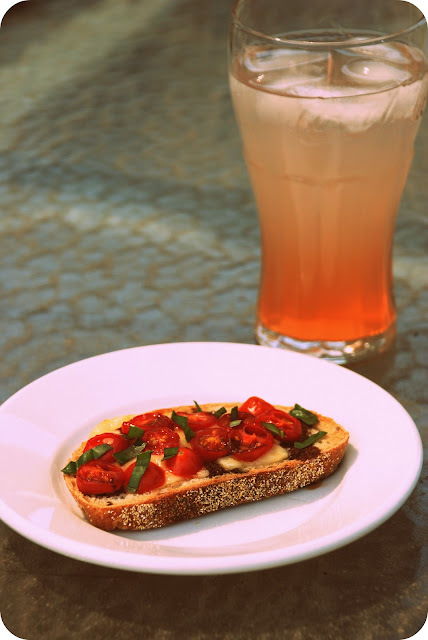 Toasts: Place cheese on bread, top with tomatoes. Place in toaster oven for 3 minutes, or until cheese melts and tomatoes begin to wilt. Remove, and sprinkle basil leaves on top. Drizzle with oil & vinegar. Would also work well in conventional oven, on broiler setting for 1 to 2 minutes. Note: this recipe is not intended for use in the microwave. Lemonade: Mix all ingredients and enjoy immediately. Preferably under the sun. What a delightful treat that must be, I shall make some asap as I too, have a huge Basil plant outdoors! I have an awesome (hubby calls it weird) way to use fresh Basil and Tomato!!! When making frozen pizza (Digornio's is the best) I top it with very thinly sliced tomato (only on my piece lol) and full basil leaves. Very Delicioso!!! Once again Allison, great Blog, keep em coming!! Hi Allison. We also just started a basil plant on our deck, as well as mint and lettuce. It's quite rewarding to just step out and pick a few leaves to add to the plate and palate. Kinda cool showing off when visitors are over too. It's difficult here in the north to find the weekend farmers markets we got so spoiled with down south. Thanx for following and congrats on your running.